This part is simple: Velcro and neoprene belts are not for serious lifting. In fact they are often worn under a normal leather belt by professional powerlifters. They don’t really provide much support to a more seasoned lifter and are sometimes just used to keep the back warm. They can be useful if you are suffering from a stiff back and for light work where a bigger support would get in the way. Olympic lifts are an example of the sort of thing that they could be used for. Many people believe that double pronged is not necessary and only adds to the inconvenience when putting on and taking off. The concept behind double pronged is that the forces are spread across the two prongs and so it is less likely to fail. In theory this makes sense but in practice, we have yet to see a single pronged buckle fail. If you buy a good sturdy belt, it won’t matter between the single pronged vs double pronged buckle. A single prong is fine as it should provide enough protection and is easer to use. Lever belts are different to the pronged variety. As the name suggests, these have a simple lever mechanism to lock and unlock them. These make them much easier to use, especially when compared to one with a double pronged buckle. A belt with a lever will also be much easier to get tight than a similar one with prongs thanks to its mechanism. But having a system like this means that it can break, and they sometimes do. Many manufacturers of lever belts provide warranty mainly for this reason. They also often sell replacement parts for their items with a leverage mechanism. Many people prefer pronged clasps as these are easier to adjust and therefore share around other lifters in the gym. Some levers have only a single setting and so cannot usually be adjusted without a screwdriver. Also if you’re gaining or losing weight and you like the versatility, one of these can be quite inconvenient. Inzer have created a ratchet based belt that can create the tightness of a lever system but can also be easily adjusted offering the best of both worlds. The lever mechanism can create excellent tightness but you also get the ease of adjustment similar to what pronged fastening offers. Of course having the best of both comes at a cost. And that cost is about twice the price of a standard pronged belt and about half as much more than one with a lever. Oh, and for professional lifters, this type is against the International Powerlifting Federation competition rules. The thinner 10mm versions are generally aimed at the lighter lifter or female powerlifters. 13mm weight belts are recommended for anyone looking to get serious. Most belts are 4 inches in width. This is also the maximum width allowed by most powerlifting federations. There are also 3 inch belts on the market which you sometimes see being used by crossfit enthusiasts. Then there are also tapered belts. These are not great for the regular powerlifter as having the full 4″ inches all around the body gives the abdomen more to push against creating more intra-abdominal pressure. The more pressure you have, there more efficiently the force can be transferred and thus more weight lifted. There are more details on this process on our purpose of a weight belt section. Tapered belts have advantages in some situations such as if you are a smaller person with a short gap between the ribs and hips. Under these circumstances, a full size 4 inch belt can sometimes dig into the hips or ribs leading to unnecessary bruises or cuts. Some people also prefer a tapered belt for deadlifts as bending over can be difficult if you are big guy. A tapered belt is not to be confused with a dipping belt which is tapered as it rests mainly on the back. It is generally said that you should take your time if you are new to lifting and not wear a belt until you can lift a certain weight. This is so you can build up a natural strength before you hit a plateau where the risk of injury increases and a belt is necessary. Some people use numbers like “you should be able to squat 315 or deadlift 405” or sometimes it’s 1.5x your bodyweight. If you are someone who competes and cannot wear a belt when doing so, it doesn’t make sense to train with a belt. So track athletes or team sports athletes wouldn’t benefit much from wearing one and should learn to effectively brace without wearing a belt. This is one of those things which will differ from person to person and people should definitely get comfortable with squatting and deadlifting without before venturing into the world of support accessories. We recommend training for at least a few months beltless before investing in one. Remember also, that there is a learning curve when you start using a belt and it does take some practice to get the best out of one. The technique to using a belt correctly involves pushing against it and getting your breathing right. For example, when squatting you would start standing as normal with the bar on the shoulders. Before lowering, you would take a deep breath and hold it then push against the belt. With this pressure built up and held, the movement should be performed. Compared to when lifting beltless, you should feel greatly improved stability of the back. When you reach the bottom, for the best performance, you should perform something called the Valsalva maneuver. This is the act trying to exhale when the airway is closed. Just like you would do if you were trying to push a heavy piece of furniture. By doing this you create additional pressure inside the body for the drive back up to standing position. If you purchase a high quality belt, it should last you forever or until you outgrow it. Many powerlifters or just gym belt wearers have had belts that have lasted them 20 years and are still going strong. We recommended paying a little more and getting something made from real leather, ideally from one single piece and not layers glued together. We prefer the single prong variety over double pronged due to them being easier to get on and off. 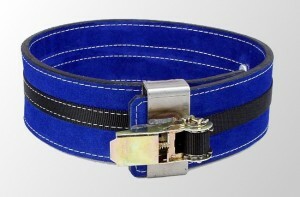 A lever belt is ideal for those who don’t vary in weight much as adjustment can be inconvenient. For the ladies, we recommend viewing our guide of the top womens gym belts. This is some sweeet info. I would be good if you guys added some stuff to do with how to get the right sized belt e.g. how to measure yourself and also maybe the correct way that they should be worn. second James’ comment–a relatively quick read but somehow managed to cover all of the essential information for understanding what a weight belt is, how they differ, and what’s the best type for my needs. For instance, a novice might try on a tapered belt and choose that one because it is far more comfortable and yet has just as much support in the back–but as this article says, the 4” width in front, gives your abdominal muscles something to push against.